Throughout National Smile Month we’ve been challenging foodies across the UK to bake with our favourite tooth friendly ingredient xylitol. One of our bakers, Elisa from Happy Skin Kitchen, decided to come up with her very own recipe, and even though she had never baked with it before her xylitol cookies turned out perfectly. No surprises there – who doesn’t love peanut butter with chocolate? They are super easy to make and they taste so rich and decadent without the naughty ingredients. Pair with a cup of hot chai latte for the ultimate guilt free snack. Preheat the oven at 180 degrees. Covered a baking tray with parchment paper. In a large bowl with a fork mix the peanut butter with coconut flour and the baking soda. Add all the remaining ingredients aside from the chocolate and stir thoroughly. Scoop 1 tablespoon of cookie dough at the time and with a fork mashed delicately down onto the baking tray. Keep doing so until you finish all the dough. Place in the oven and bake for 15-17 minutes until they are slightly golden brown. Remove the tray from the oven and let them to cool for about 10 minutes. They will still be soft as soon as you taken them out but they will harden once cooling down. Melt the dark chocolate by placing into a ceramic or glass bowl on top of a pan half full with boiling water. Turn on the hob onto medium heat and gently let the chocolate melt, stirring from time to time. Dip half of the cookies into the melted dark chocolate and place them back onto the cooling rack until the chocolate has become solid again. Store in air tight container or jar and enjoy for up to a week. Want to try our baking with xylitol challenge? Give Elisa’s recipe a go. Don’t forget to upload a snap to Instagram and tag @peppersmithuk so we can see your creations. 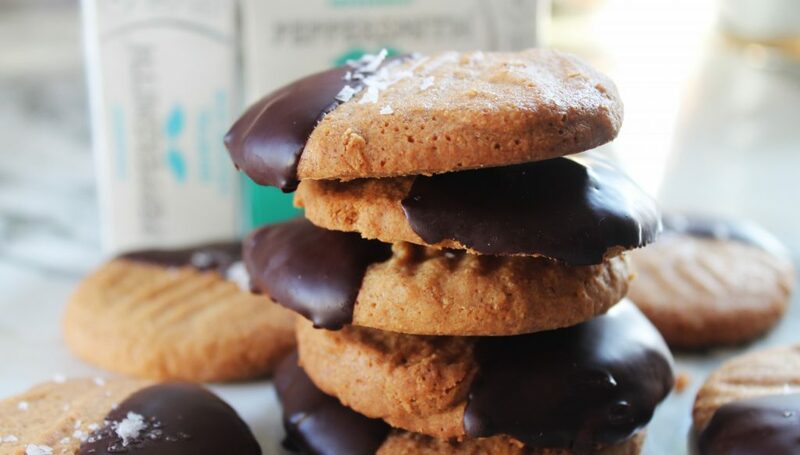 The post Sugar free peanut butter and xylitol cookies appeared first on Peppersmith.